One of the highly rated trip of mine, where we discovered more places (i.e explored places which do not feature in tourist map). There are many places and exploration of each can fill up 10 days itenary easily. 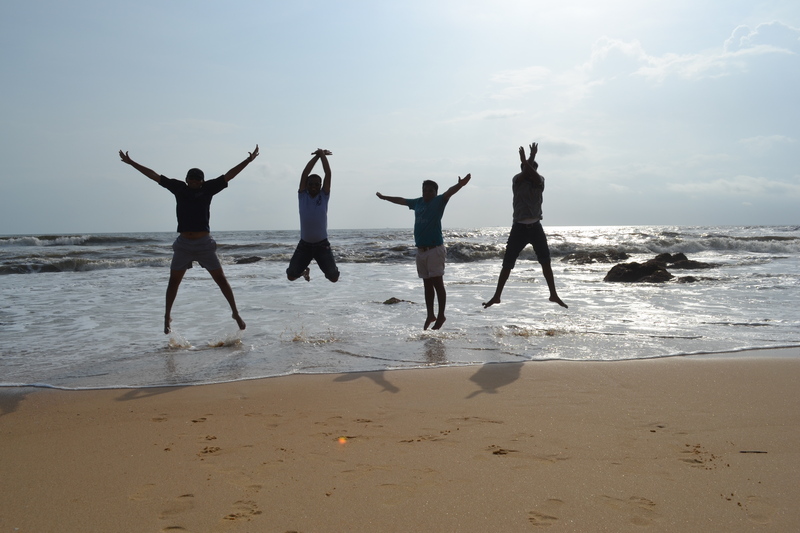 Places we visited: Murudeshwar, Jog Falls, Marwante beach, Udupi, Manipal, Malpe beach, Suratkal beach. Our plan: Bangalore to Murudeshwar by bus. Sight seeing for 3 days in car. 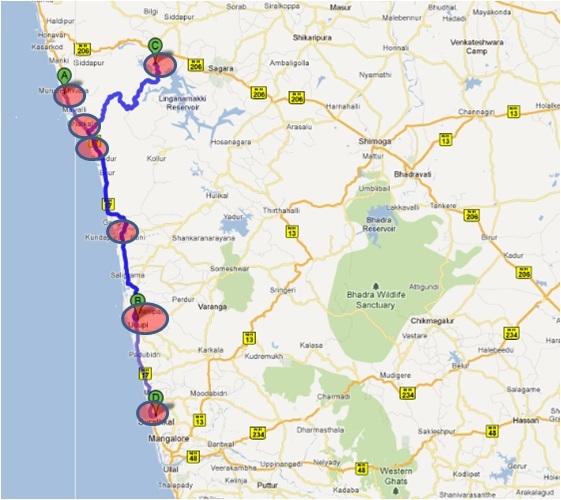 Mangalore to Bangalore by bus/train. 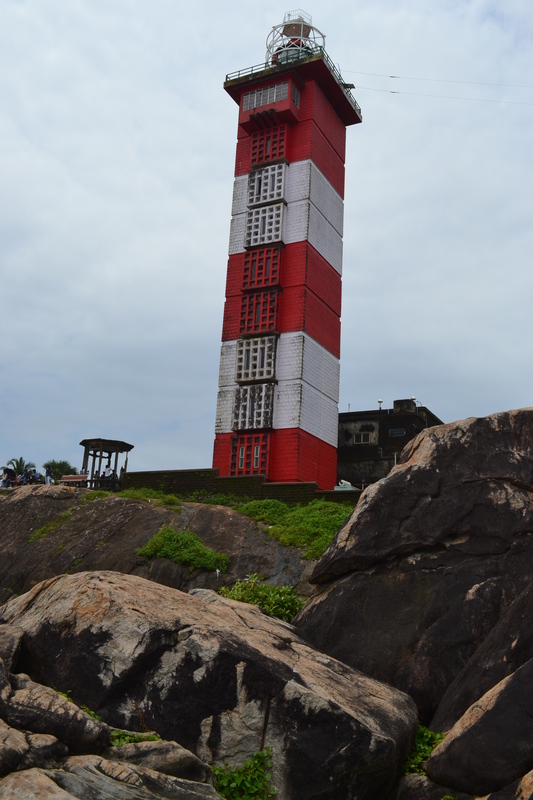 Some more places:Gokarna beach, Honavar beach, St. Mary’s island, Karwar, Mangalore beach. Yana (bit inside). The temple town is built by RNS group. Home to one of the largest Gopuram & Lord Shiva statue, the place has got some significance in Hindu mythology. The Village, just 2KMs off NH-17, is well connected with Udupi, Mangalore, Goa with night buses also going to Bangalore & Mysore. Nearest big railway stop is Bhatkal (20 Kms) & airpot is Mangalore (170KMs). RNS residency & Navneet beach resort are best available option to stay. Other one is Kamath, where we stayed, but that should be tried as last option. Food wise, Naveen beach restaurant is most popular option. Food is good, but the place in understaffed & is a confused place during crowded times. Other available options are Navneet beach resort restaurant, Kamath restaurant. Getting late dinner can be a problem. The biggest attraction of the place of-course is well maintained temple & long n wide beach. Donot forget to go to top of Gopuram (18 floors, Rs 10 per person) by lift, to get some awesome view of temple, beach n town. On clear sky day, donot miss sun set. In NH-17, you never more than 5KMs away from beach. So you can explore beach anytime, by crossing mangroove forest dividing NH-17 & sea. We explored one, & I bet you will enjoy. But most important thing, please please donot litter. Even spitting also seems to be crime, seeing the beauty of forests. 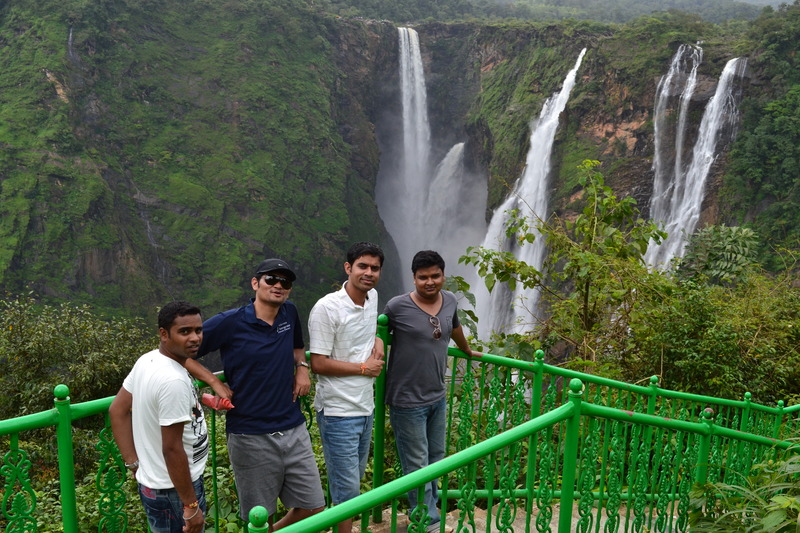 Jog falls on river Shravati is the highest water fall in India, falling by around 230 mtrs . It has many number of falls namely called Raja, Rani etc. In heavy rains, all of these merge to form a really gigantic fall. But that happens rarely (it happened in 2009), as flow is restricted by an upstream dam. Govt. has improved infrastructure facility, by provising railed & marbled 1600 steps leading to bottom of falls. The place is well connected by Shimoga, Mangalore, Udupi, Bangalore, Goa. Monsoon is the best season to see the falls, when it is at its best possible glory. Food wise, options are basic & restricted. There is few hotel to stay overnight. Do visit the top of fall as well, which is accessible from a point, 2 KMs before the main entrance. Just 20 KMs north of Murudeshwar, has got beach & backwaters. The river bridge over river Sharavathi is picturesque. Bhatkal, 20KMs south of Murudeshwar, has also got its own beach, although we didn’t go. Marwante Beach:Another awesome beach bordering NH-17.Here the highway is sandwiched between sea & river. Govt has developed some decent infrastructure in terms of Toilet facility & food. Boat ride in river & sun set view are other attraction of the place. Many highway trucks stop here, as they cook n eat their food, while soaking in the beauty of the place. 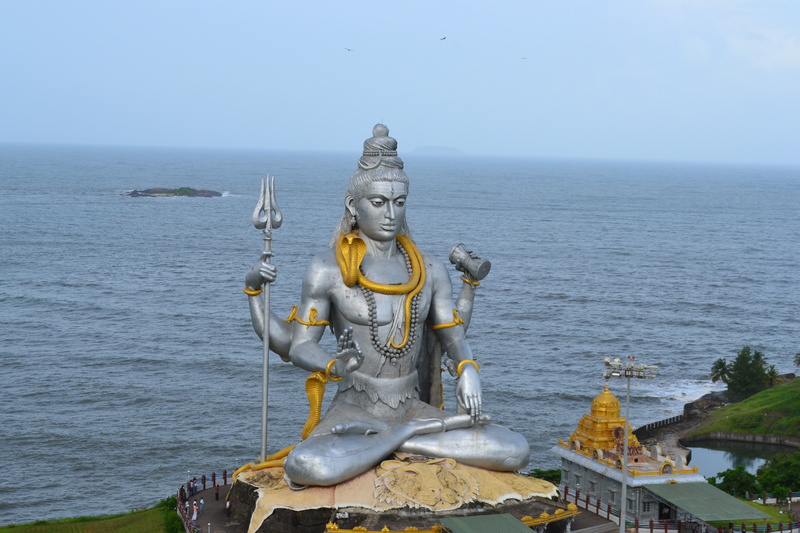 Catch any Murudeshwar-Udupi busto reach here. Udupi: Sri Krishna temple: 60KMs north of Mangalore, temple town of Udupi is famous for Lord Krishna temple & of-course its cuisine. Udupi vegetarian food are world famous. The restaurant inside the temple is most famous among all & is highly recommended. As such in temple, male are required to remove there shirt. Early morning is best time to visit, to avoid some crowd. As usual, main sanctum was dark & gods were hardly visible. Few seconds is all you get to get a glance of almighty. 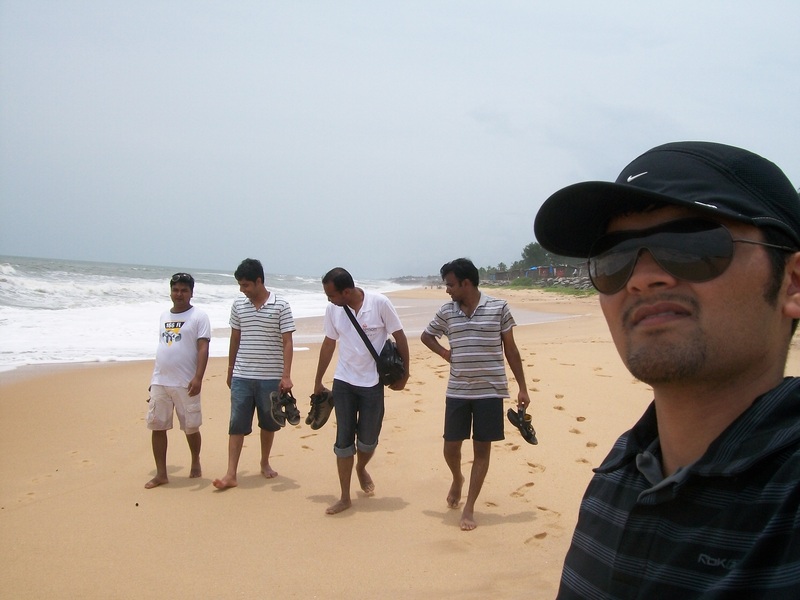 Malpe beach: 5 KMs from Udupi, is one of the best maintained n beautiful beach I have seen. There are just 2 resorts on beach & so tickets needs to be booked beforehand. This is the getway for St. Mary’s Island, which remain closed in rainy days. BTW, Malpe has got a big fish catching port & so will be one of the best place to have sea food. 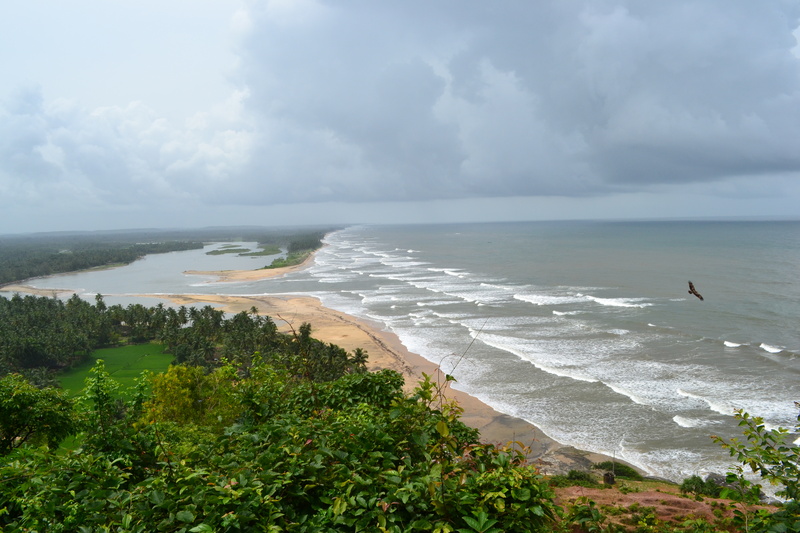 Manipal: 5KMs from Udupi & 10 KMs from Malpe, is a top small hill. It’s a university town & predominantly got student population. Because of youth, the town is a very happening place with late night life boasting of number of pubs, disco, multi cusine restaurants, fast food, cafes, ice-cream parlour n so on. But the high point for me about this place has been “End point”, a view point inside college campus, famous for sunset & stunning view of surrounding. Malpe beach is visible from here. The town has direct connectivity with Bangalore, Goa, Mysore & round the clock connectivity with Mangalore & Udupi. It has got some “ok” budget hotels, for obvious reasons. NH-17: In general this route is very very picturesque. Arabian sea overlooking suddenly rising Western Ghats & NH-17 getting sandwiched between these two giants, make it a perfect route to travel & ride on. If your taste is sea beach or sun set or sea food, then this is the place to be. Frequent bridges over backwaters, surrounded by either rice fields or coconut forests, is truely blessing to eyes & green carpet formed during monsoon all around, is like icing on the cake. This was all about our trip. There are still many places, which I didnot mention, as it was not covered in this trip. But after this trip, I realise NH-17, spanning from Mumbai to Cochin n extending to Kanyakumari (as NH-47) is one of the best route to ride & monsoon(or winter) is the best season to cover it.